Supreme Court Will Re-Hear Immigrant Indefinite Detention Case : The Two-Way The case centers on a man who was detained for three years without the right to appear before a judge and ask to be released on bond. 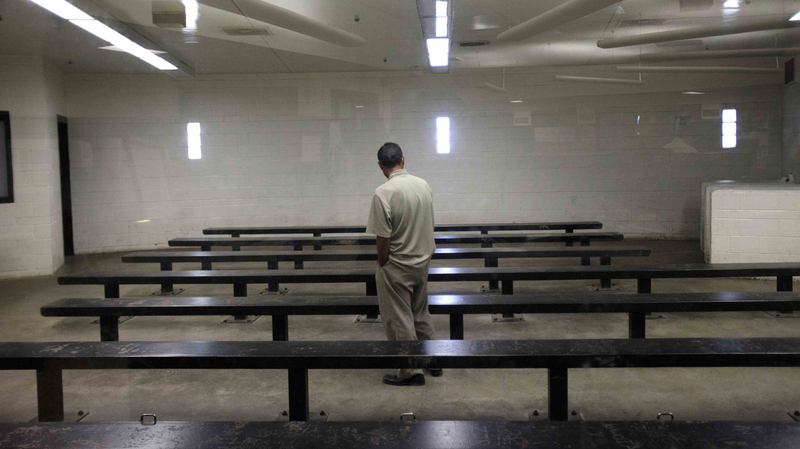 A man waits to be processed at a Border Patrol detention center in Imperial Beach, Calif. The U.S. Supreme Court says it will re-hear a case that asks whether immigrants detained by the government have a right to a bond hearing to challenge their indefinite detention. The case was argued in November 2016, months before Justice Neil Gorsuch filled the vacant seat of late Justice Antonin Scalia. It has implications for legal permanent residents that the government wants to deport because they committed crimes and for asylum seekers who are awaiting a court date after turning themselves in at the border. Immigrants' advocates contend that many of these immigrants have a right to be free on bail until their case is heard. The case pits David Jennings, the field office director at U.S. Immigration and Customs Enforcement in California, against a legal permanent resident, Alejandro Rodriguez, who came to the U.S. as a child and worked as a dental assistant. As a teenager, Rodriguez was convicted of joyriding, and at 24, he pleaded guilty to misdemeanor possession of a controlled substance. In 2004, U.S. Customs and Immigration Enforcement began deportation proceedings against Rodriguez. He was ultimately detained for three years without the right to appear before a judge to ask for bond. The 9th U.S. Circuit Court of Appeals ruled that the immigrant detainees and asylum seekers can't be detained indefinitely and that they have a right to a bond hearing every six months. The appellate court also held that in order to hold these detainees, the government must show that the immigrants would pose a danger or become a flight risk if set free.